So you’re into making beer, are you? Well then let’s talk about some of the best beer making kits for beginners that you can now find on the market, shall we? If you just go and look at what’s available on the market, then you’ll get distracted and won’t know precisely which kit to choose. 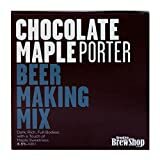 That’s where I can help you – I know my way around a beer kit as I dabbled with this myself a while back. 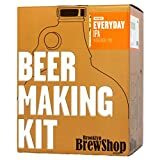 If you have a little time, then let me share with you some of my favorite beginner beer making kits. 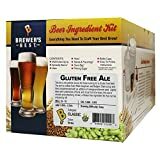 Hopefully my reviews will help you to get started making your own brews at home. 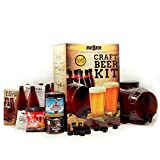 These kits also make great gifts for beer enthusiasts – perfect Valentine’s Day gift for beer lovers, gifts for bachelors, as well as any other gift-giving time of the year. Quick Answer: What Are The Best Beginner’s Beer Making Kits? To help you decide on which of these kits is the better choice for you, give a read through my reviews below. As I compare each one, you should be able to determine the one that best meets your needs. Now, let’s talk about each one and see which is better. This one is first on this list for a very simple reason, well 2 actually: it’s highly regarded by all of my friends who used it and they have determined it a 4 out of 5 score from their discussions and I also want to note that I think the price for it is very affordable. This has a reusable 2-gallon keg with a lid and tap assembly to make things easier for you. 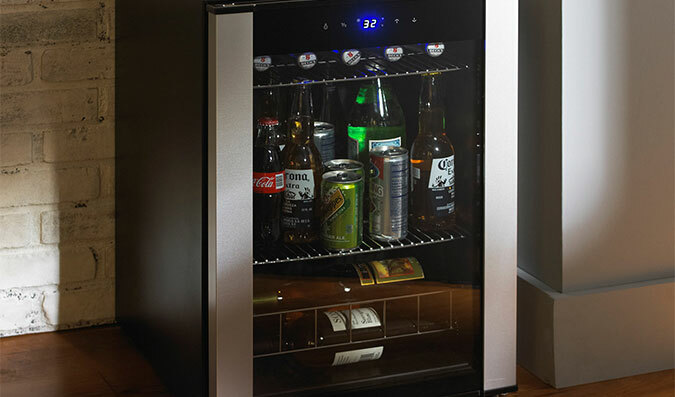 The keg is made from FDA compliant plastic which doesn’t impart any taste or flavor migration keeping the original taste of the beer unaltered. Also, the keg has a wide mouth which makes it easy to clean and to use while brewing. The instructions are quite easy to follow and divided into 4 steps, which is perfect for the novice brew master. The kit has 11 reusable 740ml plastic bottles all having caps and beer labels. Like they say: all you need to start is water! Bottom line: this is one of the best beer making kits for the money right now. Definitely check this one out. 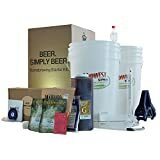 This is another kit from Mr. Beer that is very good for the home brewer who is just getting started. The system is very similar to the Premium one described above – the same instructions, the kit comes with almost the same things, etc. Our reviewers give it a solid 4.5 out of 5 rating, so it’s a really good starting point for a beginner. It’s very cheap, if you are on a budget but still want to give this hobby a try for yourself. In my opinion this is a great way to start making your own beer. You can make hard cider with this kit or even mead if you’d like. I think this is the best way to begin right away. Is it the best kit out there? It depends on many things and there are probably better kits but because of its price and as it already has everything you need to start and you can also find a lot of recipes on their website (some even better than the recipes that come with this kit), this is a great choice for a beginner. Shop around for the best price. 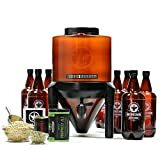 While still a decent option for those just getting started, this one is a bit more advanced home beer brewing starter kit in my opinion. 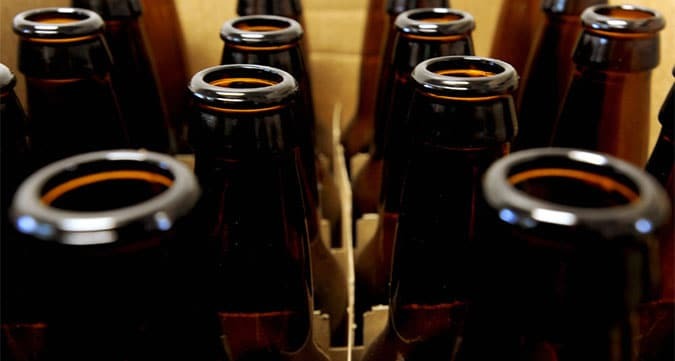 It contains quality items (better quality than the Mr. Beer) but the biggest drawback is the fact that you actually need to invest more money to purchase bottles to put the beer in and other things like bottle caps, a large wooden spoon to stir the wort, 1 or more 5 gallon pot(s), etc. This makes it unattractive for beginners and I would suggest getting it right now. Maybe later when you have a bit of experience with brewing and need something better and bigger. Another disadvantage of this kit is it’s designed to make 5 gallons which will take some time. It’s much better to start out with making 2 gallons – it will go a lot faster and you can enjoy the fruits of your labor quicker. The price of this kit is also a bit high for my liking. Though there is no denying that this is a quality option. If you feel like this is the best starter kit for you, then start your price comparison shopping on it to get it at the lowest possible cost. This kit is another very good kit that is highly regarded among beer making kits. Our reviewers give it a 5 out of 5 from over 75 batches! 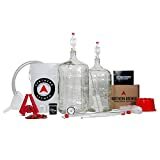 It’s price is affordable enough but you will need to invest more in getting bottles, caps and everything else already mentioned for the earlier carboy kit (above). 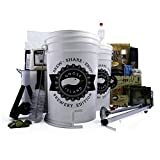 People say they’ve made some great beer with this kit, but as I said, this is not really beginner friendly because you need to purchase a lot of other things to get started and you also have the “5 gallon” issue and need to wait 3-4 weeks before you actually know if the beer is good or not. Not really recommended for beginners – more for intermediate and advanced users or those dedicated to the craft. 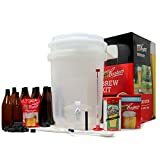 Overall, these are some of the best beer making kits for beginners on the market and while they are all good I recommend you choose from the ones produced by Mr. Beer because they are beginner friendly and do not require any further investment.